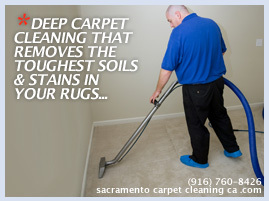 Carpet Cleaning Sacramento offers a professional carpet cleaning service in Sacramento, CA, if you thinking about installing new carpet in your home or just to clean the carpet you already have, go ahead and read what we have to offer it might save you time money. Once you've made the decision to install carpets in your home or business, there are several things you have to think about and decisions you must make. You need to decide if you want the carpet to spread from wall to wall, or provide an accent in a particular area. You need to think about whether you want natural fibers or synthetic, something custom made or a carpet that's mass manufactured. Budget is, of course, another important factor. The final, and perhaps most important item on the list is finding an efficient, trustworthy, competitively priced carpet cleaning service; one like Carpet Cleaning Sacramento, the most trusted name in residential or commercial carpet cleaning in Sacramento, CA. Everyone who's ever owned a carpet knows the importance of vacuuming regularly. Vacuuming is the process which utilizes suction to remove surface dirt and dust. But even the most powerful vacuum cleaners cannot efficiently remove all the debris that finds its way to the base of your carpet. Every step you take pushes dirt, dust and bacteria further down into the carpet, between fibers where it is trapped until more drastic measures are taken to remove it. In addition, there are tiny living organisms - dust mites - that thrive in just such conditions. Ignoring this inevitable build-up can lead to a shortened lifespan for your carpet, and potential health hazards for you. Carpet Cleaning Sacramento Professional cleaning service, use industry standard methodology, is the only way to effectively deal with this problem and avoid the potential downside of owning carpets. Carpet owners have been searching for the best way to clean their carpets every since carpets were invented. It is important for the savvy consumer to familiarize themselves with the advantages and disadvantages of today's popular methods. Carpet shampoos - typically a DIY method using products readily available at supermarkets or hardware and DIY stores. This method, which involves applying a liquid or foam type of shampoo to the carpet, letting it dry and then vacuuming, is not recommended as it has been shown to actually promote future carpet staining. Another fallback of this method is over-wetting of the carpet, which almost certainly leads to the development of mold and mildew. Steam cleaning - the most popular, and most effective method for cleaning carpets and upholstery. Carpet owners can buy or rent machines to do this themselves, or hire Sacramento Carpet Cleaning outfit to conduct the cleaning. When conducting DIY steam cleaning, it is imperative that you use only well serviced machines with sufficient heating mechanisms, as well as efficient extraction units. Professional organizations use industrial grade equipment, such as truck mounted steam cleaners, for the most effective cleaning available. 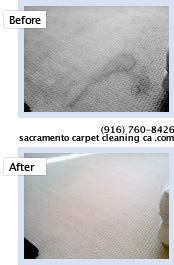 Carpet Cleaning Sacramento helps you enjoy your carpet longer, more healthily. Call us today at (916) 760-8426 for a free quote.